When Stoner Drug got its start in 1896, the word "stoner" didn't have the hippie connotation it does today. But the pharmacy likely sold cocaine and opiates, back when they were legal. So reads the sign on Interstate 29 as it winds by the farm town of Hamburg, Iowa, population 1,187. Surrounded by sprawling farmland and foothills, Hamburg is wedged into the southwest corner of Iowa between Missouri and Nebraska. The first business off the exit is a John Deere (DE) dealership, and the heart of town is a sparsely inhabited Main Street, with a smattering of parked cars but nary a person to be seen. 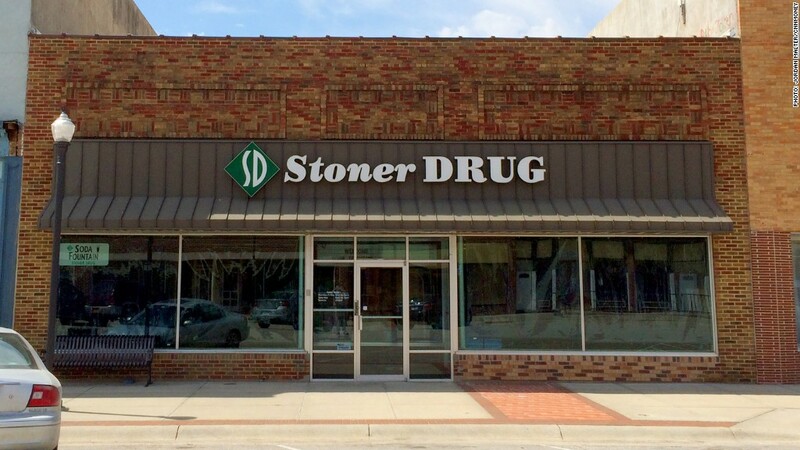 While Stoner Drug is easy to find, the storefront is so nondescript, you might think it's out of business. But you'd be wrong, because Stoner Drug is very much in business, and has been for 118 years. The first thing you see when you walk in the door is a rack of tie-dyed T-shirts emblazoned with the store's name. That's when you realize that you're actually a tourist -- and that the people who work at Stoner Drug are in on the joke and making money from it. The T-shirts, sweatshirts and gifts -- along with the vintage soda fountain at the center of the room -- bring in between $10,000 to $15,000 a year. "If we charged for bathroom stops, the number would be much greater," said Phil Kuhr, a Navy vet who became a pharmacist through the GI Bill and has worked at Stoner Drug for 35 years. "A lot of people just stop outside and take pictures." Kuhr, the store's manager, said they used to sell the shirts online, but it didn't last. "We shut [the site] down because no one really knew how to maintain it," he said. "I did not have the time to fool with it." After all, the real business is in the back, where the pharmacy is located. Kuhr said that's the big reason for Stoner Drug's profitability and longevity. "My main focus is on prescriptions," said Kuhr. "That's 95% of our business." A pharmacist named Cosby Stoner opened the drug store in 1896 in a building that no longer exists, located two blocks from its current location, where the store has been since the 1950s. At the time of its founding, the word "stoner" didn't have the hippie meaning it holds today -- and nobody thought it was funny to associate "stoner" with "drug." The store didn't start selling its ironic T-shirts until a century after its inception. But as it turns out, the name isn't so ironic after all. Kuhr said Stoner Drug and other 19th century pharmacies typically sold tinctures, or trace solutions, of cocaine and laudanum, a powerful opiate. "I'm not sure when heroin was first formulated, but laudanum was perfectly legal back then," said Kuhr. "It was available over the counter. Cocaine was also legal." He's not sure what cocaine was used for, but laudanum was one of the few available painkillers for patients suffering serious diseases like cancer. In John Wayne's last Western, "The Shootist," the terminally ill gunslinger is prescribed laudanum by a doctor, played by James Stewart. But then the Harrison Narcotics Tax Act came along in 1914 and spoiled the party. Few people today, except for readers of William Burroughs, have even heard of the act, which was the first legislative restriction on opium and cocaine. For the first 18 years of its existence, Stoner Drug really did live up to his name. But times have changed. "Currently here, the big thing is meth," said Kuhr, "and we have to record sales of pseudoephedrine."